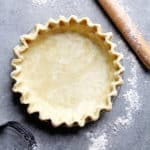 Easy, delicious and perfectly flaky, this all butter perfect pie crust recipe will become a favorite for all of your pies. The best pie crust recipe ever! Thanksgiving is all about pies. Pecan pies, sweet potato pies (not pumpkin pies in my family), chess pies and so many more are front and center on our holiday dessert table. The foundation of any incredible pie is the crust. You simply don’t have a great pie without a flaky, buttery, melt in your mouth crust. You need my perfect pie crust recipe to make the best pies you and all your holiday guests have ever tasted! This is the perfect pie crust recipe to end all pie crusts, and it only has a few ingredients. It is all butter. For years, I went back and forth between all butter and a mix of butter and shortening. I still do waver occasionally however this one is all butter, and I really like the texture and flakiness of it. More than that, the flavor is undeniable. To make a perfect pie crust recipe, you must have super cold ingredients. Incredible pie dough requires cold everything. Cold butter, cold water, cold hands. This will ensure that your pie crust is very flaky. The air pockets that the cold crumbs of butter form in the flour are irresistible when it interacts with the heat of the oven. If you sense the butter is getting warm, it’s time to place that bowl in the fridge and let it cool back down. Because it can be warmer in our homes around this time of year due to weather changes (or in the summertime if you are making delicious pies then), be very cognizant of how your pie dough is doing. That’s why I always stick the pie dough in the fridge for a bit for it to relax and cool back down. I know there are tons of recipes that call for a food processor but I love using my good ole pastry cutter or two forks. I like to have different sizes of butter throughout. The food processor can sometimes create butter pieces that are too small. Also you definitely feel like you are more in the pie making process when you get your hands a bit dirty. I can’t imagine what my big mama would think if I pulled out a food processor for pie dough. I love a little bit of hustle in the kitchen. It makes me feel like I am doing something. Lastly, I know that this time of year can mean that it makes more sense to short change and cut down on additional work in the kitchen. I get it! Refrigerated pie dough from the grocery store can be your best friend in a pinch. 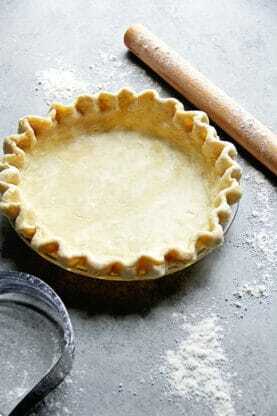 However making homemade pie crust isn’t difficult and isn’t as time consuming as one may think. And there is absolutely nothing like it when it comes to taste. So give this Perfect Pie Crust a chance. You can make it ahead and freeze it to save time and grab it from the freezer when you want to make your pie. Your Thanksgiving and summertime demands it. In a medium sized bowl, add flour, sugar and salt and whisk together to combine. Next add your butter cubes to flour and using your pastry cutter, cut the butter into the flour mixture until various sized crumbs appear. Slowly add the cold water into the flour until a ball of dough forms. Start with 1/2 cup and add more water if you need it. Knead the dough quickly to bring it together. Don't worry if there is any flour left in the bowl. Remove the dough from the bowl, cut into 3 or 4 sections and round into balls. Cover each ball tightly with plastic wrap and place in the refrigerator for 30-45 minutes to rest. If you want to freeze the additional balls, this is a great time or you can roll out into pie plates and freeze. Remove dough from fridge and add a bit of flour to a working surface or clean counter and place dough on it. Using a rolling pin, quickly roll dough out to about 1/4-1/3 inch thickness and place in your pie plate. Decorate according to your preference, bake and fill with fillings of your choice. Hi There! I have to tell you, I have been struggling for over 20 years trying to make a pie crust as good as my Mother In Laws. I am still convinced she left something out. I tried your pie crust last night. What a dream! I followed your directions exactly. I could roll it out like a pro, perfect circle and all, and my husband loved it! So THANK YOU Pie is no longer a problem in this house thanks to you! I am NEVER EVER Using shortening again. Hooray! Thank you so much Laura! That makes me so happy. What’s the difference between a regular sweet potato pie and the sweet potato chess pie ? The chess pie is all about a texture difference to be honest plus the corn meal makes a taste difference as well. Can you freeze the pie crust? yesss-I’m firmly on team all butter pie crust!! Yours looks amazing! Team butter is seriously the best team ever! How long do I bake and at what temperature, a 1 crust pie (like for lemon meringue)? Hi Kat, it would really depend on your recipe. This pie crust recipe can go into any recipe of your selection for your pies and then you can bake according to the instructions of the lemon meringue recipe. You can also blind bake ahead if you would like. I’ve always been too intimidated to make a homemade pie crust, but you make it look so easy! Definitely pinning to try this holiday season! Thank you! I’m a bit confused. Does this recipe make 3-4 pie crusts or just 1? If it’s just 1, is it enough for a top and a bottom? If it’s just 1, do you you then take the 3 or 4 balls and mash them into 1 big ball, then roll it out? Yes it makes 3-4 different doughs for pies. It is more than enough for top and bottom and depending on size of the pie pan, it can make top and bottom twice. Oh, yeah! Bring on the pies is what I say! Gotta start with a great foundation, too! Love that it’s this easy to make your pies a success! That is the most perfect pie crust ever! can you use this recipe for double crust pies? Yes you totally can. It definitely makes more than enough! 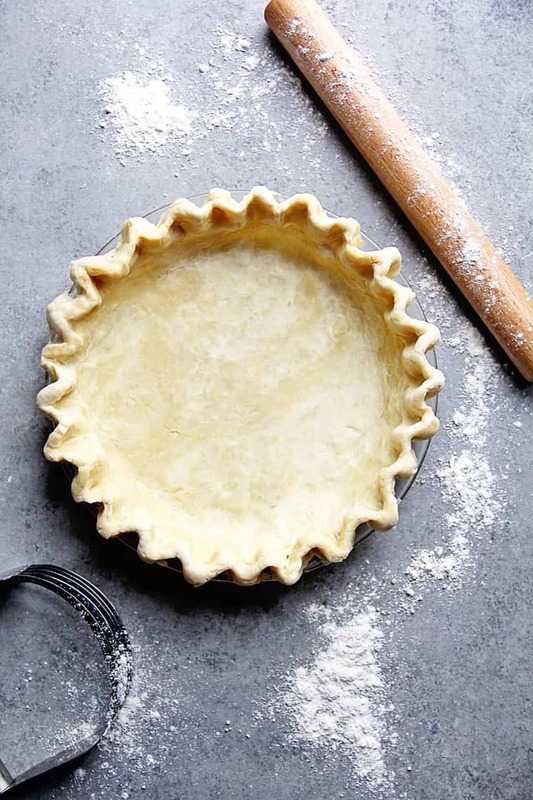 Love how easy this pie crust recipe is! I’ve never made a pie crust from scratch, but I’m feeling a little inspired now! Hooray! I hope you do it! A lot of folks don’t realize that making your own pie crust is not only more rewarding and flavorful but relatively simple to put together. Keep up the good work on your food blog Jocelyn. It looks wonderful! I’m usually one for convenience but during the holidays it’s nice to go out of the way and make something completely from scratch. It just feels like I’m putting more love into it to share with others. Thanks for sharing!